Egypt is an unincorporated community in Whitehall Township, Lehigh County, Pennsylvania, United States, about 7 miles (11 km) north of Allentown and 1 mile (1.6 km) west of Cementon. Egypt is located on Pennsylvania Route 329, just west of its intersection with Pennsylvania Route 145 at Eagle Point. The population of Egypt is 2,391 as of the 2010 census. 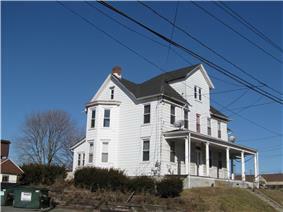 Built in 1756, the Troxell-Steckel House is one of the oldest buildings in Lehigh County. Located near Egypt, Fort Deshler (seen here in an 1895 engraving) was built in 1760 to protect settlers from Indian attacks during the French and Indian War. Egypt is one of the oldest communities in eastern Pennsylvania, having been settled as early as 1733. It was the first settlement in Pennsylvania north of South Mountain. Early Pennsylvania German settlers of nearby present-day Lynn and Albany townships had named the area where they settled Alle mängel ("all wants") due to the poor quality of the soil on which they were trying to farm and raise crops. By contrast, the soil here was found to be quite fertile, and early settlers named this region "Egypta," since ancient Egypt, with its fertile Nile delta, was the "granary of the world." The Reformed Congregation of Egypt Church was established in 1734, and a log church was erected in 1764. The cemetery of the Egypt church contains the graves of many of the region's earliest inhabitants, including 25 veterans of the American Revolutionary War, 15 veterans of the War of 1812, and nine veterans of the American Civil War. Across the street from the church stands Egypt's World War I monument, which honors the 76 men from Egypt who served during that war. Dedicated on June 10, 1923, the centerpiece of the monument is the pressed copper sculpture, Spirit of the American Doughboy, by E. M. Viquesney. 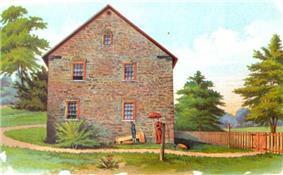 In 1755, Jacob Kohler established a gristmill, located along the Coplay Creek just south of the church. The Troxell-Steckel House, which was built in Egypt in 1756, is one of the oldest buildings in Lehigh County and is today operated as a museum and historic site by the Lehigh County Historical Society. The Egypt area was also the location of Fort Deshler, a French and Indian War era frontier fort established in 1760 to protect settlers from Indian attacks. The fort, which was near the present intersection of PA Route 145 and Chestnut Street, stood until about 1940. The site is commemorated by a Pennsylvania Historical and Museum Commission marker. A granite marker, located just outside of Egypt at Scheidy's Road and Spring Street, commemorates the last Indian attack in Lehigh County, which occurred on October 8, 1763, when nine settlers were murdered. The earliest hotel in the area was the Werley House, which operated from 1796 to 1815. The first "English school" (as opposed to one that taught students in the  Other early industries in the immediate area included a carriage works, coal yard, bakery, tannery and silk works. Development of the community was spurred by the organization of the American Improved Cements Company (later American Cement Company), which took over and modernized the older Egypt Mills cement plant, located on the north side of Chestnut Street. In 1884, the company shipped its first load of cement to market using the Ironton Railroad. In 1896, American Cement ran power lines to supply the village of Egypt with electricity from its own power plants. American Cement, which subsequently opened a number of mills in the Egypt area, operated until 1913, when it was purchased by Giant Portland Cement. In addition to the Egypt Mills plant, Giant Portland operated six other cement mills in Egypt (Pennsylvania, Columbia, Giant #1 & #2, Central and Reliance), and had an annual production capacity of 2.1 million barrels of cement. Parts of the New York City Subway was built using cement manufactured in Egypt's mills. Giant Portland ceased production around 1929, and mills were either closed or sold to other companies operating in the area. Today, cement production remains an important part of the local economy, and plants in the area are operated by Nazareth-based ESSROC a subsidiary of the Italian firm Italcementi, and the French company Lafarge. On June 2, 1947, the Philadelphia Phillies came to the Egypt Park to play an Egypt area high school team of the old Twilight League. The Phillies came to entice Curt Simmons, a 17-year-old Whitehall High School pitcher from Main Street in Egypt, to play for them. Curt Simmons took the Phillies to the wire, and the Phillies came back and tied the Egypt team 4-4 on account of darkness. Now the Egypt Community Church, the Egypt Church was established in 1734. The present church (seen here), was built in 1851. Dan Koppen, professional football player, New England Patriots. Curt Simmons, former professional baseball player, California Angels, Chicago Cubs, Philadelphia Phillies and St. Louis Cardinals. Egypt is part of the Whitehall-Coplay School District. Students in grades nine through 12 attend Whitehall High School. ^ Roberts, History of Lehigh County, Page 1016. ^ Roberts, History of Lehigh County, Page 111. ^ Roberts, History of Lehigh County, Pages 104-107. ^ a b Roberts, History of Lehigh County, Page 1015. ^ a b c Gensey, Page 106.